Set during the roaring 1920s jazz era, Chicago tells the story of Roxie Hart and Velma Kelly, two murderesses in Cook County Jail. Driven by ambition, both women try to grab the spotlight, whilst trying to clear their names. Velma Kelly- (Alto) Tough and sarcastic. An ex-performer, used to being the main attraction within the prison. Fred Casely (Non-singing) Roxie's boyfriend at the beginning of the show. 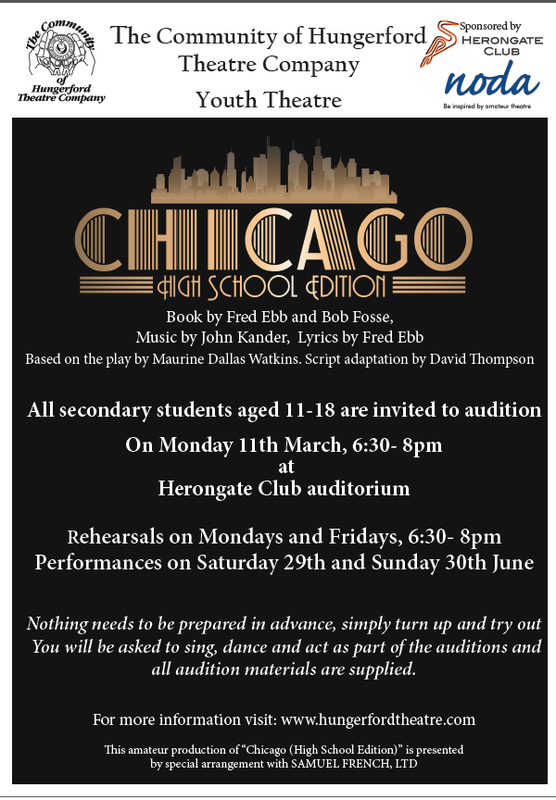 Roxie Hart (Mezzo) 'As pretty as she is self-centred', Roxie's search for fame and glory is the driving force in Chicago. Amos Hart (Baritone) Roxie's husband, a mechanic who is ignored by everyone around him. Fogarty (Non-singing) Police officer who investigates the murder of Fred Casely. Liz- One of the 'merry murderesses' of Cook County jail. Murdered her husband as he popped his gum too loudly. June- One of the 'merry murderesses' of Cook County jail. Murdered her husband when he accused her of cheating. Hunyak- One of the 'merry murderesses' of Cook County jail. Speaks Hungarian. Accused of chopping off her husband's head, although she is most likely innocent. Mona- One of the 'merry murderesses' of Cook County jail. Billy Flynn- (Baritone) A Suave and manipulative lawyer who defends the women in Cook County Jail. Mary Sunshine (Soprano) A sappy newspaper columnist who relies on emotion to write her stories. Kitty- (Non-singing) A vicious murderess who momentarily grabs the spotlight. Ensemble: All members of the ensemble are numbered and have allocated lines within the show. They act as the masters of ceremonies, reporters, prisoners, jury etc. They also appear in most musical numbers.